For as long as I can remember, I've always wanted a farmhouse sink. It fits my cottage style aesthetic and there's really nothing more charming. 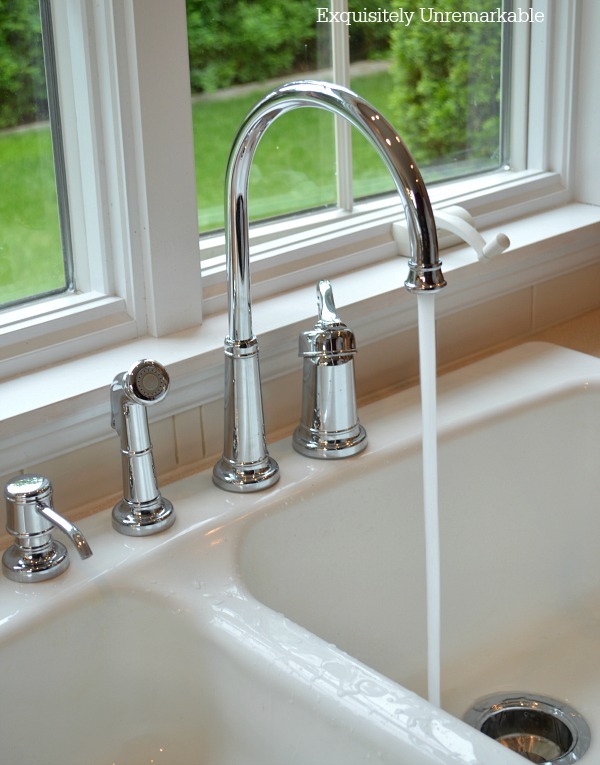 *Pfister Faucets provided me with this beautiful faucet, but all opinions expressed here are my very own. Unfortunately, for me, it just never seemed to be in the cards. When we moved into this house and renovated, my husband and contractor both conspired against me citing cost, construction and leaks, so I abandoned the battle. After fifteen years, I still wish I had that sink...every single day...and spent years trying to create the look with what I had. When it comes to design, the devil really is in the details and I can tell you my home is cottage style all I want, but if it doesn't look that way, well, then it's not. And my modern style sink area was not. Unfortunately, there was nothing really wrong with my sink or my fixture, so there was never a reason to change either. Then one day, as luck would have it, a pipe burst (old house woes) and I got my reason. Now. I have to tell you that this story does has a very happy ending, but spoiler alert, I didn't get that apron front sink. Nope. Turns out, finding a drop in one to fit an existing countertop is an impossibility. They just don't make them anymore. But that's ok. 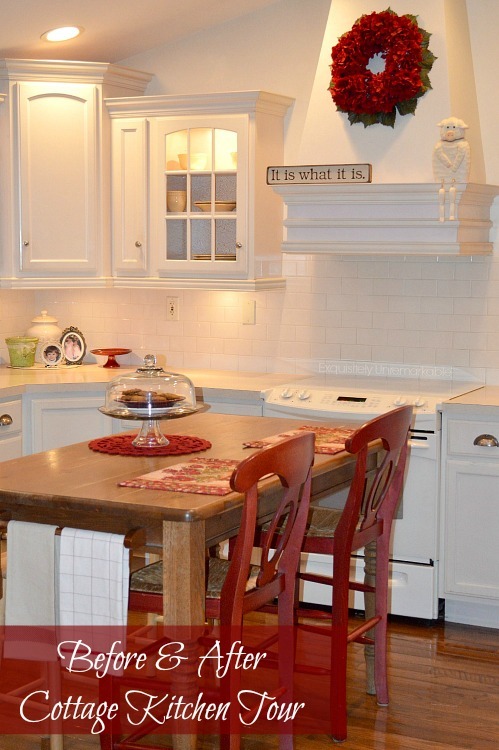 I was able to get that gorgeous farmhouse look in my kitchen ~ better than any I could've imagined with just a few inexpensive changes ~ and it's all thanks to my brand new Pfister faucet. The journey begins here, with a hodgepodge of mixed fixture parts, because we needed a short term fix for that leak. Functional but not pretty. Hoping for inspiration, I checked Pinterest. I made drawings. 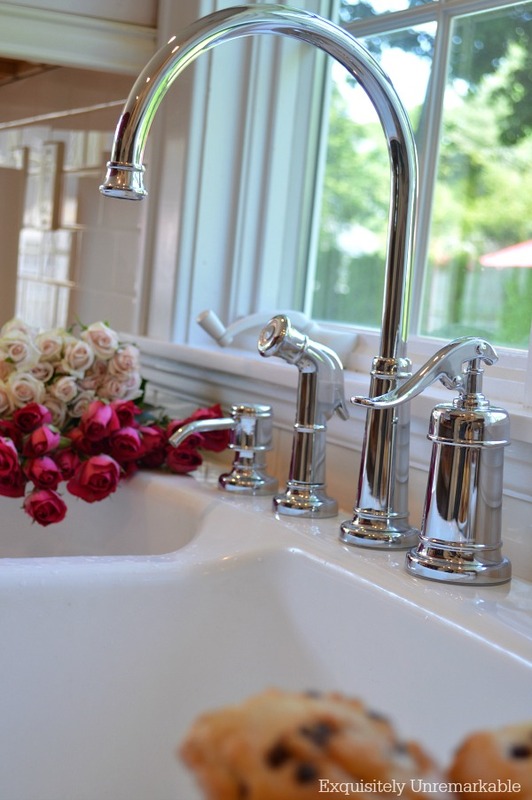 I dreamed, schemed and planned until I found my muse in a chrome faucet from Pfister's Ashfield Collection. I chose the chrome finish, because it's a classic. And it's shiny. I really like shiny. The style was just what I was looking for, plus I'd had a Pfister faucet before, the Marielle, also in chrome, and was extremely pleased. It was gorgeous and worked well for over fifteen years. I knew I was in good hands. When it arrived, I couldn't wait to open the box and get started. Inside was everything I needed. Well, everything my husband needed. He's the real DIY guy. I just dream things up, he's the one that actually makes it all happen. While he was impressed with the weight of the fixture and the parts included, I was immediately drawn to the water control. It reminded me of an old fashioned pump. It had that simple, utilitarian style which is what drew me to the design in the first place. And did I mention it was shiny? My husband was more focused on the instructions. He's super handy and probably could've installed this in his sleep, but he said the manual was very clear and if this were his first sink rodeo, he would've been able to easily do it from the directions provided. Once he gathered his supplies, Mr. Handy Dandy removed the old fixture pieces ~ good riddance ~ and then crawled under the sink to connect everything. 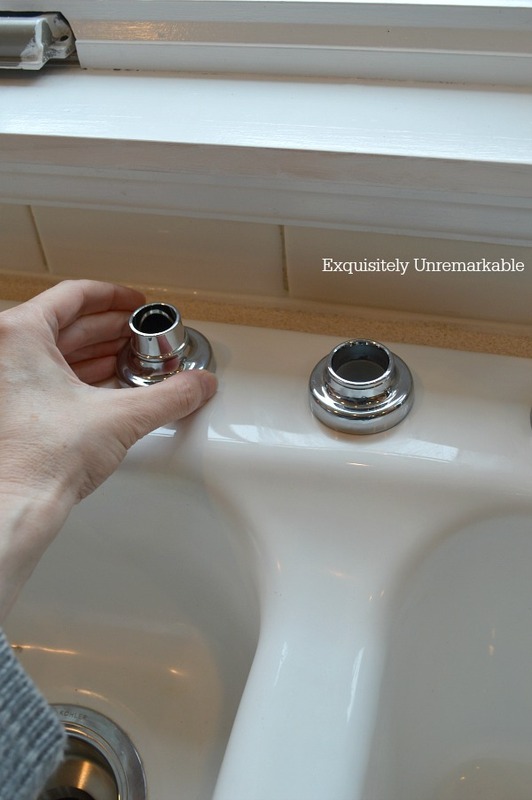 ...and holding the faucet parts in place on top of the sink while he tightened them down from underneath. Mine was clearly not a very technical role. It didn't take him very long to complete the task. I would say within a half an hour, we had water and I had that cottage style farmhouse kitchen sink I had been craving for years. It was amazing. The whole area was instantly transformed. With his job done, my husband packed up his tools and I got to play with mine...flowers, food and my fabulous new faucet. I have to say, I adore the way it looks in the room. It's farmhouse perfection. And coupled with a few minor decor changes, including a new skirt and moulding which I will share later, I now have the farmhouse sink area I have always dreamed of. Even if I don't have the actual farmhouse sink. Thanks to my new fixture. And a little help from a broken pipe. I love your new faucet and especially that "pump" although the tip of the faucet and the sprayer is very cute too and the base of the parts also. To answer your question about what type of sink I have, I have to admit that your farmhouse looks more authentic than my farmhouse. I have a stainless steel sink with an industrial style faucet. Not farmhouse at all. But I do have a vintage white cast iron sink that I will be using as an outdoor sink that has the same feel as your white one. A little different in style, it has a high back and wall mounted faucets and a drainboard but the same substantial white drop-in style. Fun post. Looking forward to seeing the rest of your changes that you teased us with. Hi Lorri! Thanks so much for your kind words. I have to say I am thrilled with the new look and I agree, all parts of the faucet are just perfect. I love the fact that the sprayer face is gray, too. A lot of the sprayers I saw had a different color there and it didn't look right. There's that design OCD again! 😉 And I know the sink you're talking about. I love that style. We actually looked a few, because honesty, that's the dream sink, but since we have a window behind the sink, it didn't work. I can't wait to see yours in action. 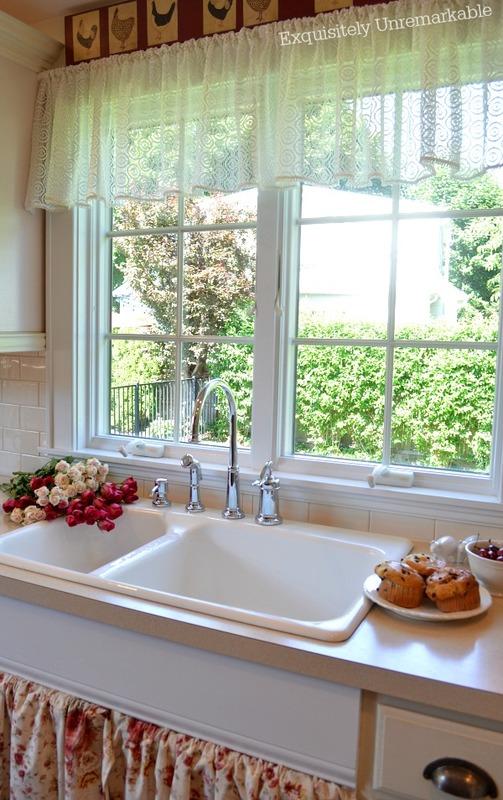 I have a window over my sink too. Nice to look out...limiting if you have a hankering for a high backsplash sink! Oh it does look wonderful. I love it, so perfect for your farmhouse vibe. Thanks so much, Marty! It makes a huge difference in the room. What a great faucet they gave you. Beautiful. I love the pretty look it gives your kitchen. I love, love, love it! I like farmhouse style too. The water control is so cool! Looking some “farm house” . . .
and I am loving the look . . . I have a window . . .
And Pfister has the answer . . .
And a Mister Irish to crawl under. . .
Me to hold things in place . . .
One more idea . . .
Lovely new faucet! The skirt makes anything "farmhouse!" Thanks Nancy...and that skirt has a secret. I'm almost ready to reveal it! I love it! I do not have the sink I want, my dream is a farmhouse sink. Of course I like yours a lot too! That fixture is wonderful and makes a huge difference in the look of your kitchen! Thanks Deanna! I know...that sink is an elusive accessory in my house. For now, I am more than content with my new look. IF I ever need to replace the countertops, I will get that sink, but for now, they're in perfect condition and I can't think of anything better to put there...so the sink stays! Good luck in your quest! 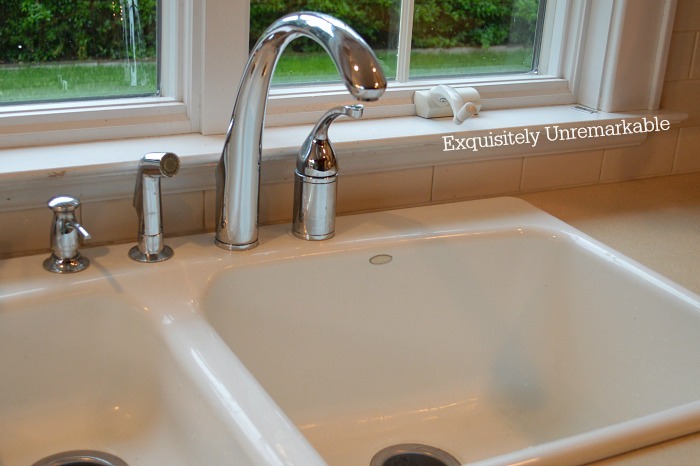 Well, I like your fixture, and I like your sink, and I LOVE your cottage style Kim! Me, I didn't get the decorator gene, but you certainly have! I've always admired your style. We used to have a white sink like yours, but now we have a black granite sink, which goes with our décor. I like it OK. That would have been me doing your Mrs. Handy Dandy job, while the Mister did his. Aren't we lucky to have a Mr. Handy Dandy? Thanks Florence!! That DIY was quite a dance, let me tell you. I was supposed to be holding, but I was too busy staring at my beautiful shiny new fixture. Very nice! 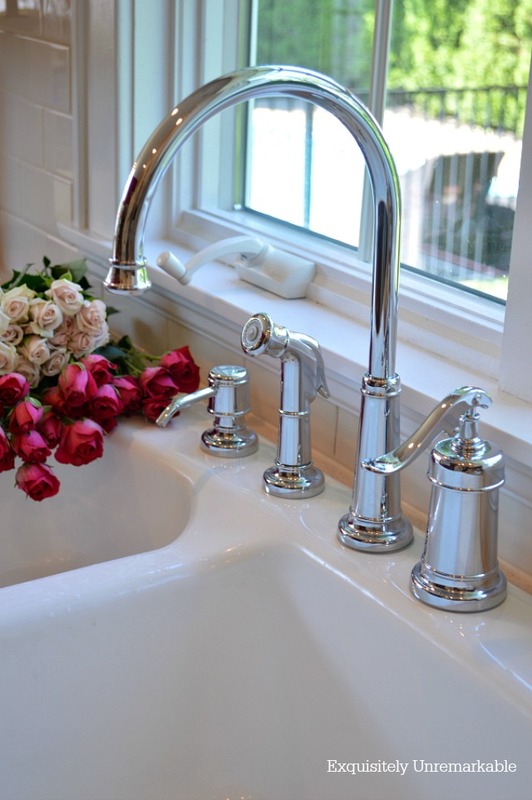 Love the faucet...I have the same style and love the look. I too dream of an apron sink in new shiny white porcelain but it probably won't happen in this house. I love when a simple change makes a world of difference. Hopefully you are set for another 15 years!! Thanks AnnMarie!! 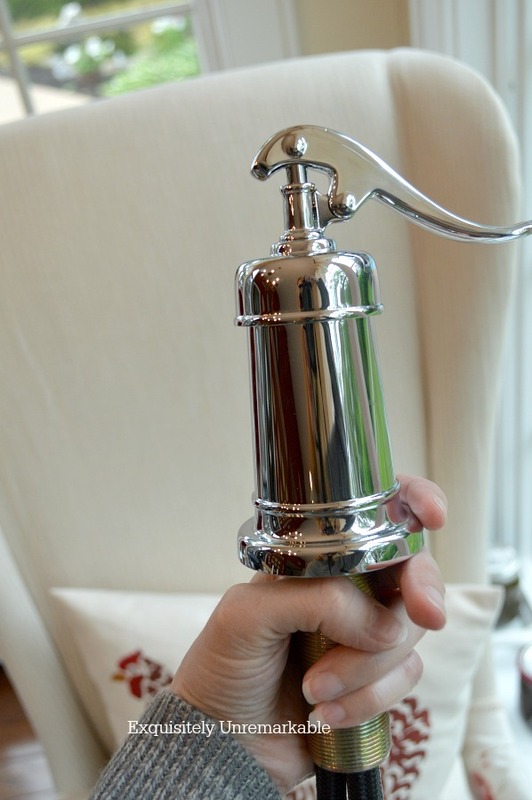 It is a great faucet. I love it...and yes, here's hoping I'm set for a good long time now! Looks awesome and what would he have done without you to help, haha! :) What is funny is that I had just been reading a memoir about life on a farm back in the depression era and the ONLY water that was pumped into the house via a windmill system was to the kitchen sink. NO bathroom yet, no running water anywhere else. All washing up done there. Absolutely does, Deb! You know when I was little, back in the 70s, we would go to my grandmother's house which was built in the early 1900s and it still had pull chain toilets. I kid you not. They were original wooden boxes, very cool...I wouldn't want to go outside to use the bathroom or get water, but there is something very charming about the idea of it all. Thanks Nancy!! 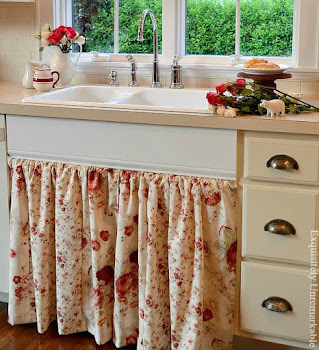 I have to say between the faucet and the skirt, I am all set...and yes, I love that look and when I was perusing Pinterest for sink ideas, I did see Anita's. It's lovey. Mine is a little different than hers...it has a secret which I am almost ready to share! Hugs!! I adore that faucet Kim, and I’m thrilled that YOU’RE thrilled :). Thanks Doreen!! I am thrilled and I think my husband is too. Now he doesn't have to listen to me and my farmhouse sink conversations anymore. Now I just say, thank you, a lot! 😉 He likes that better. Just beautiful! 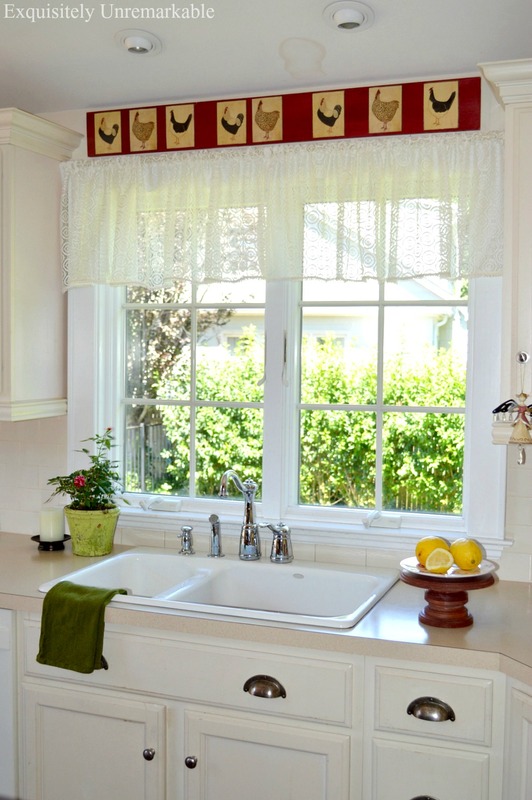 I love the skirting and beautiful curtain below your sink. Thanks Tammie! I have to say that I love my new skirt. It was the perfect pairing with the new faucet. Thanks for the visit today and taking the time to leave such a sweet comment! Very farmhouse-like! I love it! I love the skirt too. We had a Price Pfister faucet for years. 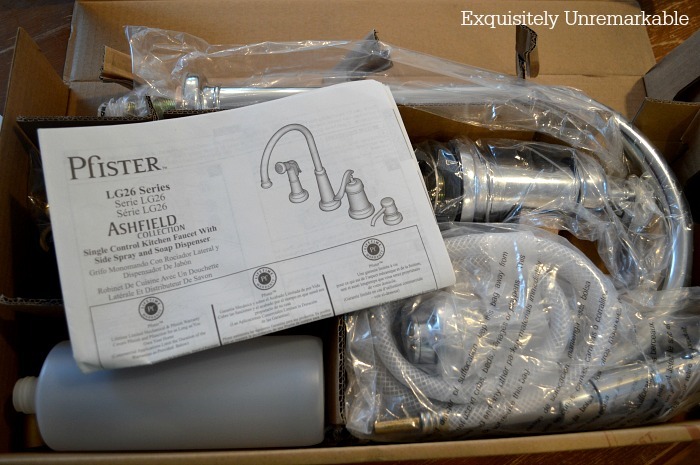 It eventually started leaking and they let us pick out any faucet from their website and sent it to us for FREE!!! Now, THAT'S a good warranty! Thanks Lisa! It has the farmhouse/ cottage style charm I was going for, even without that silly apron sink. And they do have a fabulous warranty. We had ours for about 15 years. I was just ready for a pretty change! Kim it looks fabulous! And just the farmhouse look you wanted. 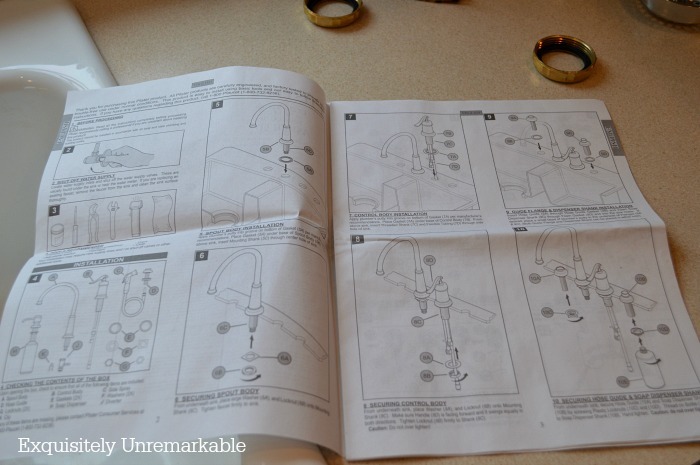 We also had to change out our faucet a few months ago and in fact it turned out to be much easier than I thought. Mary, I can't believe it looks this good. I never would've believed that a few changes could have such an impact. 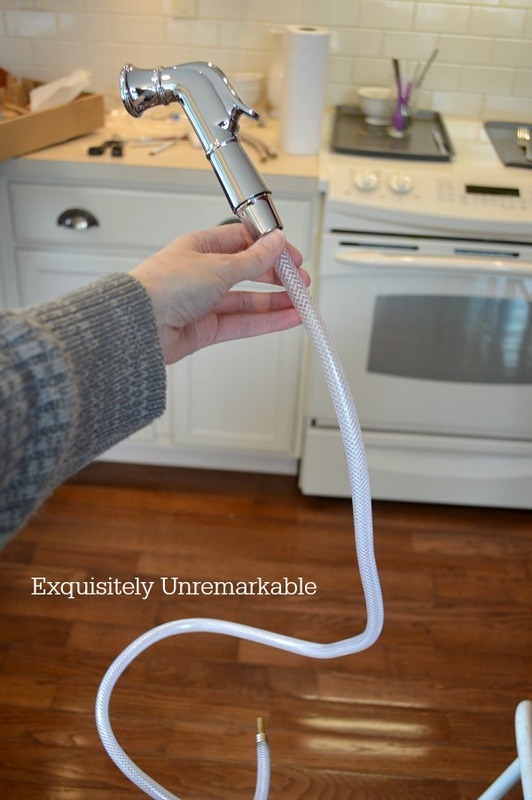 I love the faucet and yup, easy to replace! That is a beautiful faucet! I love that it is shiny!! It is a marvelous thing that you can place that by yourself. How does one learns those skills? Sending wishes of a lovely Sunday! Thanks Angela! Shiny is my thing. And my husband learned most everything working construction in high school and paying his way through college. Being a starving student does have its perks! Its perfect and really turned out quite lovely! 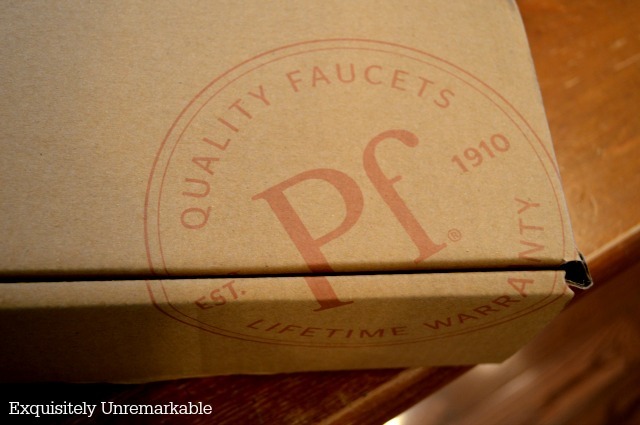 Farmhouse sink is in the house! Thanks Cathy! I think I faked it pretty well. Glad you like it, too! Very pretty faucet. 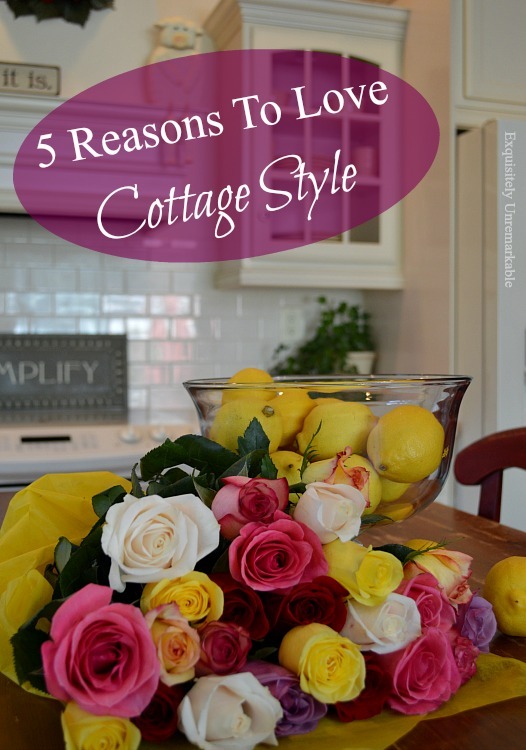 I love your cottage style! Plus your husband has mad skills!!! Thanks Ricki! And yes, he certainly does. He could build a house...I'm very lucky! Beautiful new faucet, Kim! I have a new faucet, too, but mine is brushed nickel (Moen). However, I still have a stainless steel sink and hate it. 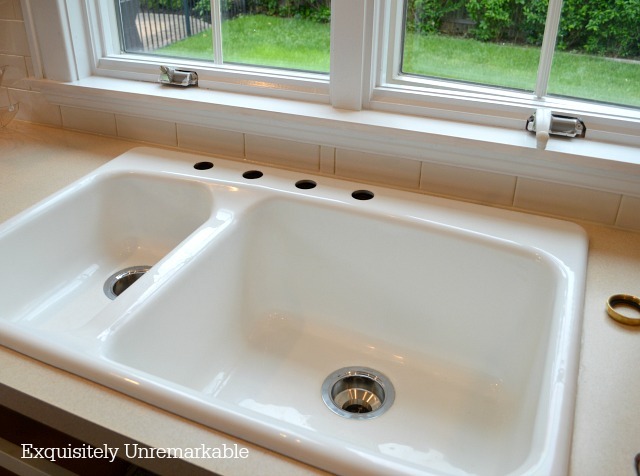 I've been dying for a new white kitchen sink! Not sure if I want the apron front one, but I do definitely want white. And we need new countertops too, plus backsplash. So I guess I'll have that all done at once. Won't be happening this year, as we have too many other expenses going on right now (new front porch and sidewalk and roofing repairs). Melanie, the apron sinks are beautiful and more reasonably priced now than they were before, but yes, if you want one you have to replace everything. 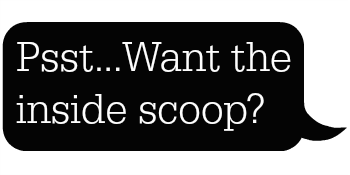 Since it sounds like you're going to do that anyway, it might be a nice choice. Of course, regular sinks are beautiful, too. I have say since we cleaned this one up, I couldn't be happier. Good luck with all your other construction projects. Those necessary repairs are nearly as much fun!! The heart wants what the heart wants... I'm glad you're happy with the new look, Kim. And that view! It must make doing the dishes so much nicer.